Rob Hampton has been in the cleaning industry for over 15 years, prior to becoming part of the NIC network he ran his own cleaning business in the West Midlands. in 2014, Rob began looking at how he could take his business to the next level and made contact with NIC as he could see the benefits of the support and national presence that an experienced franchisor could offer him. 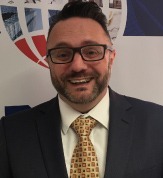 Having made the decision to join the network Rob has committed fully to the processes that NIC have in place based on their 50 years of industry experience and he has certainly seen the benefits with his business growing by over £700,000. When Rob isn’t working, he enjoys his holidays in France with his family, socialising with friends and cooking. Although no two days are the same this is as typical as they get. My day always starts over a cup of coffee in the office catching up on current events and checking my emails and messages, responding as required. I catch up with my team in the office (I have an Administrator and 2 Contract Managers) looking at the tasks that need to be carried out that day and allocating them to the appropriate team member. As my business has developed I now have a team of mobile cleaners who are used to provide cover as required due to absences, holidays or just to provide cleaners where needed, these are all in addition to my cleaning teams who work on the clients sites. Having ensured that everything is covered I spend the rest of the morning visiting clients, completing audits with them to ensure the cleaning we have provided is up to the required standard. This also gives me the chance to meet with the cleaners and to deliver any stock that is required. Today I also visited a potential client as I was in the area. Lunch time gives me another opportunity to catch up on emails and calls to arrange my appointments for the coming days. Today I am also having a catch up call with my Business Development Manager, Susan. She’s always there to provide me with invaluable support and guidance for my business. Every day I identify prospective clients to ring or email to offer our services to. I do this by using the marketing support tools provided to me by NIC including email templates, sales leads and social networking. I am also constantly searching for my own leads, taking notes whilst out and about of potential businesses to target. I aim to send 10 emails a day prospecting for new business and I will follow them all up by phone the next day. Today I am visiting a potential client in Walsall. I start the meeting by finding out what his current issues are with his cleaning to ensure I can address these and offer a solution to his problem. I am given a tour of the building, this allows me the chance to measure the floor space to accurately quote the job using NIC\’s unique custom built quoting tool. It also allows me the chance to see first-hand the standard of the current cleaning so I can spot any issues and ensure my presentation deals with these to give me the best chance of securing the contract. I always get my quotations completed quickly. I arrive back at the office and again check and answer my emails and messages, check in with the administrators and contract managers to ensure that there have been no issues, that all jobs are covered and that the sites are all fully stocked with the required consumables and that any additional jobs for the following day have been arranged. One last check of the emails and it’s time to go home, the phone is still on though!! !